Donald Trump wins the US presidency after securing swing states of Florida and Ohio and Hillary Clinton concedes. Speaking to his supporters in New York after clinching victory, Trump said that Clinton had congratulated him on his win. 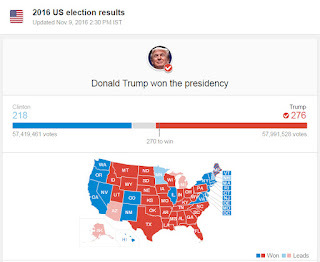 US election: How did Hillary Clinton lose? "I have just received a call from Secretary Clinton. She congratulated us on our victory … and I congratulated her and her family on a very very hard-fought campaign." Trump said it was "time for us to come together", pledging to be president "for all Americans". Clinton's campaign team said the Democratic candidate would speak on Wednesday morning.